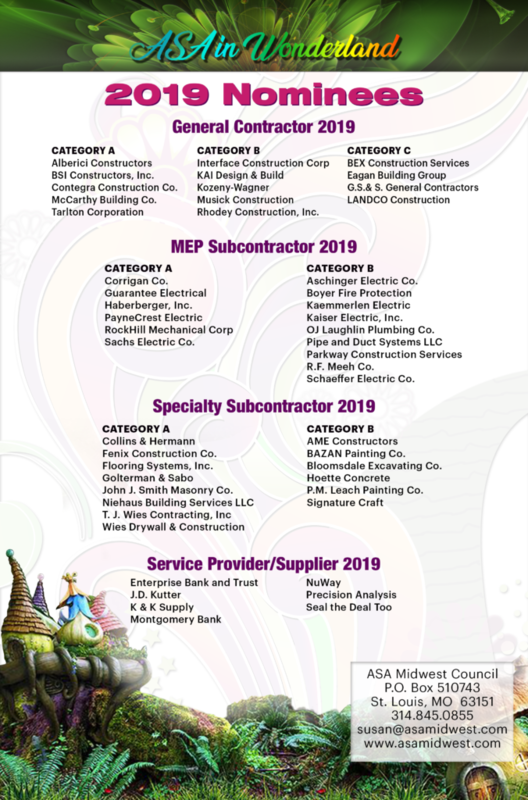 Queeny Park will be the place to be on May 15th 2019, if you are part of the STL Construction Industry! Exhibitor list below, is not final, as we are still accepting exhibitor reservations until May 1st. Congratulations 2019 Gala Award Winners! in Downtown St. Louis, for the 26th annual event. 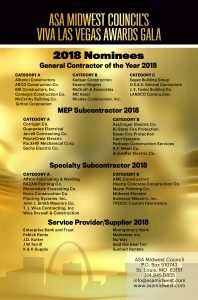 The award categories included General Contractor of the Year, Outstanding MEP Subcontractors, Outstanding Specialty Subcontractors, and Service Provider/Supplier of the Year. The ASA Legacy Award, and GC Field & Office Employees of the Year, were also recognized at the gala. The ASA Midwest Council awarded special safety awards to qualifying ASA members who have achieved work safety excellence in 2018. 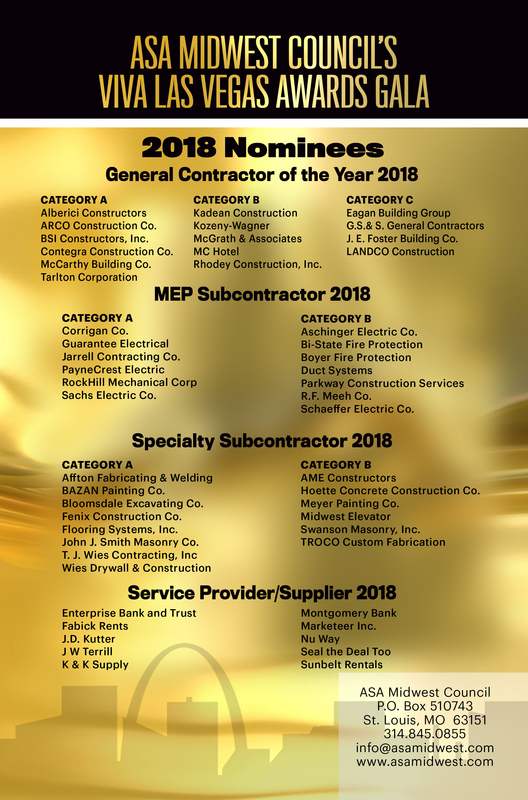 Category A Flooring Systems, Inc.
GC Field Employee of the Year: Terry Meyer, BSI Constructors, Inc.
Division V – Drilling Service Co.
MARCH 28, 2020 AT THE FOUR SEASONS STL. CONGRATULATIONS TO OUR AWARDS GALA NOMINEES! ASA Golf Tournament Draws 222 Golfers! The ASA Midwest Council’s 31st Annual Golf Tournament was a big success, drawing the largest crowd to date, with 222 Golfers! Members of the construction community gathered at Whitmoor Country Club on Monday, October 1st, and enjoyed 18 holes of golf on an unseasonably warm October afternoon. While enjoying the day, we raised funds for ASA’s own Tom Owens Memorial Scholarship, which provides funds to young adults, to continue their education beyond high school. Thank you to all of our sponsors and golfers for supporting ASA’s efforts! ASA MWC PAST AND CURRENT PRESIDENTS CELEBRATE 50! The ASA Midwest Council celebrated our 50th Anniversary with a party on November 4, 2017 at The Thaxton in downtown STL! The event was a nod to the 1960’s, when ASA Midwest Council was established! What a great way to mark 50 years of ASA empowering the STL subcontracting community through Advocacy, Education, and Cooperation! To see the event photos, just click on the link below! The American Subcontractors Association (ASA)-Midwest Council recently elected its officers and board of directors for 2017-18. Mr. Val Perales, Vice President at Bazan Painting Co. was elected as 2017-18-chapter president. Perales succeeds Ms. Amy Heeger, AME Constructors, and he will serve a one-year term which began July 1 and will expire June 30, 2018. Jennifer Church of United Rentals was elected vice-president. 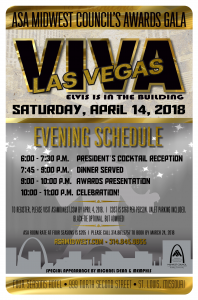 Tom Henson, of Affton Fabricating & Welding, Inc. will serve as secretary, and Mark O’Donnell of Schmersahl Treloar & Co. will serve as the association’s treasurer. 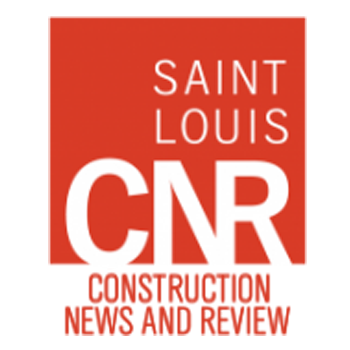 Members of the 2017-18 Board of Directors also include: Steve Albart, Enterprise Bank & Trust; Jeffrey Loebner, Gencorp Services; Brian Hayden, Hayden Wrecking; Richard Russell, Sachs Electric Co.; Chris Sauer, TJ Wies Contracting; Sal Vitale, Vee-Jay Cement Contracting. ASA Midwest Council is celebrating our 50th anniversary with a BIG party on November 4th 2017. 11.4.17 SAVE THE DATE-Additional details coming soon! ASA Glitter & Gold Awards Gala Lights up the STL Sky! Glitter & Gold Awards Gala, April 1st, 2017. ASA Midwest Council hosted 366 people, at the Four Seasons Hotel in Downtown St. Louis, for the 24th annual event. The gala was capped off by fireworks to celebrate the chapter’s 50th anniversary, and all of the evening’s nominees and winners. GC Field & Office Employees of the Year and Owner of the Year, were also recognized at the gala. The ASA Midwest Council awarded special safety awards to qualifying ASA members who have achieved work safety excellence in 2016. The 15th annual Meet the GC’s Expo featured 32 GC Exhibitors, and over 1000 attendees.